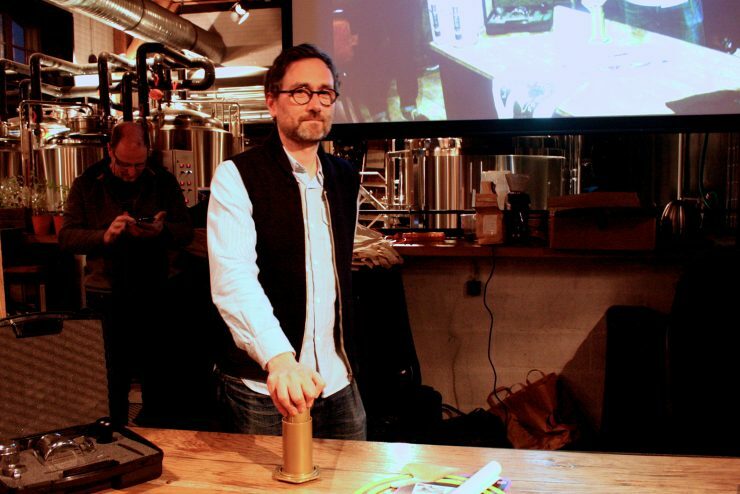 The Coffee Bar From Ipanema: K..
A Public Coffee Cupping In Nai..
A small but enthusiastic crowd turned out for the 2016 French AeroPress Championship, which took place on April 25th at Paname Brewing Company in Paris’ 19th arrondissement. The canal-side brewpub began filling up at 4 p.m., as contestants tested equipment and organizers worked out a few lingering technical glitches. At the height of the competition, there were easily 100 onlookers craning over pints of craft beer and pizza rounds to see the action. The 18 contenders vying for the title of French AeroPress Champion travelled from the four corners of France: Tours, Toulouse, Strasbourg, Lille, Nantes, and of course Paris, were well represented. Six qualification sessions were held around the country prior to last week’s competition, a first for the French competition and a testament to the growing interest in specialty coffee, and AeroPress in particular, in France. The panel of judges included last year’s French AeroPress Champion Thomas Clément (Café Cuillier); the 2014 French Coffee and Good Spirits Champion Nir Chouchana; and Viva Lenoir, representing Le Nez du Café. To break the many ties that occurred over the course of the evening was head judge and 2012 World AeroPress Champion Charlene DeBuysere. Owner of Strasbourg burger joint Katçup, Chenat plans to open a coffee shop in Mulhouse in September with his high school friend Clément Turlot, who also placed, coming in third—and he wasn’t even supposed to be competing. “The manager of Café Bretelles [in Strasbourg] where I work won the qualifying round, but he was too ill to come, so I took his place at the last minute,” he explains. Finalists all used a Finca Maputa supplied by event sponsor Café Moxka. 1st Place: Jerôme Dittmar, Journalist, Lyon. 2nd Place: Franck Chenat, Restauranteur, Mulhouse. 3rd Place: Clément Turlot, Café Bretelles, Strasbourg. 1:20-4:20 Remove the fatty film from the surface of the coffee with a spoon and wait. Photos courtesy of Réseau des Baristas de France/L’imagerie and Kate Robinson.